Please watch and forward the heartrending plea of Adva Biton whose 3-year-old daughter is in the ICU in critical condition after their car was hit by a rock thrown by an Arab terrorist 2 weeks ago. 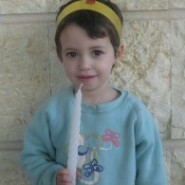 Please pray for a speedy recovery and perform a good deed for Adel Chaya bat Adva. Thanks to Allison Gottlieb for sending this to me.